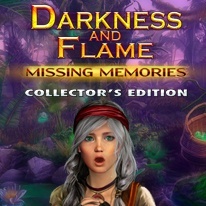 A story of a young girl involved in the battle between Darkness and Flame. Together with her uncle Colin, Alice sets out on a journey full of wonders and twists and turns threatening their lives. At the same time Colin has been getting trapped in his nightmares over and over again. A slightly familiar woman is begging him for help. The man is convinced that after he regains his memories, they will find answers to the most pressing questions. The woman from Colin's dreams, who is she? How to control the flame power his niece possesses? Two confused human beings set off to the desert where a healer who might restore Colin's lost memory lives, and the Darkness is hunting them. Together they'll have to undergo many trials, solve dozens of puzzles, and finally face the dark army threatening the whole world.